Bird breeding is rarely as simple as putting a male and female together and hoping for the best. Even Budgerigars and others that been captive bred for thousands of generations remain influenced by ancestral behaviors. Understanding this will greatly improve our success at keeping and breeding birds in captivity. The majority of pet trade birds are highly social creatures. Although they may squabble during the breeding season, the presence of flock-mates is a strong breeding stimulus. Indeed, many aviculturists cite the absence of additional individuals as the main reason for breeding failures among well-bonded pairs. Even reliable captive breeders such as Budgerigars may not reproduce if held in single pairs. The addition of another pair, or even housing the pair within sight or hearing of others of their kind, often spurs nesting. Despite the fact that group situations may encourage breeding, we must also bear in mind that birds living together form themselves into cohesive flocks. Newly introduced individuals, even those suitable as mates for unpaired birds in the flock, may be attacked, especially during the breeding season. Oddly enough, larger flocks are often more peaceful than small groups (a rule that I’ve found applicable to creatures ranging from fishes to baboons!). Aggression tends to be meted out among several as opposed to 1 individual, and non-target birds often “get involved” and divert aggressors’ attentions. In most cases, youngsters should be removed from their parent’s cage once they are feeding on their own. 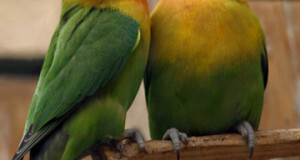 Otherwise, they may interfere with the rearing of later broods, or may be attacked by the male (monk parrots and other colonial nesting species are often exceptions). 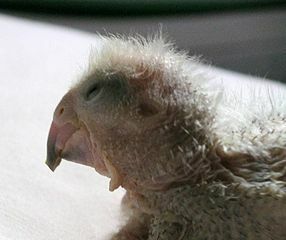 Usually, smaller, short-lived species (lovebirds, parrotlets), and those that inhabit harsh environments (grass parakeets) are likely to attack newly-fledged youngsters Such birds are evolutionarily adapted to reproduce often, or to be ready as soon as the unpredictable rains arrive, and so are usually eager to re-nest. 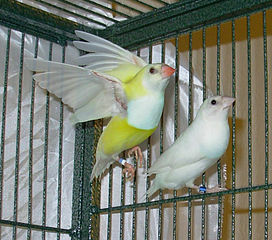 However, despite being opportunistic breeders, budgerigars and cockatiels are often tolerant of fledglings. Large, long-lived parrots usually raise only a few chicks each season, and may not breed every year. Unlike the species described above, most inhabit environments that offer predictable weather patterns and food sources, and so they can “afford” to spend a great deal of time in imparting survival skills to their young. Macaws, African Gray Parrots and similar species are, therefore, usually quite tolerant of their youngsters long after they have left the nest. Birds can be quite choosy (maddeningly so!) when it comes to mate selection. 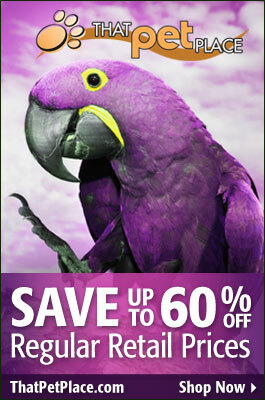 This is especially true for macaws, Amazons, African Grays and other long-lived parrots. Their pair bonds span many decades, so it behooves them to “get it right” the first time (I’ll avoid here the obvious parallels one could draw regarding our own species!). If you are intent on breeding, it would be prudent to purchase a bonded pair or individuals that mutually groom and spend time near each other. Some species deviate from the usual “parrot pair model”. Certain Australian Parakeets, for example, have “difficult” relationships outside of the breeding season…they remain as a pair, but the females become somewhat aggressive towards the males. In the close confines of captivity, they can make life quite miserable for their unfortunate mates. As always, research your pet’s natural history thoroughly. To read about what behaviors to expect as spring returns, please see Spring’s Effect of Parrots and Other Birds. very informative thanks, do u feel its the same with conures of different species but closely related? Thanks for your interest in our blog and the kind words. I do feel that most of what is mentioned in the article does apply to conures – I’ve kept large groups of Patagonians and a few other species in zoo exhibits and they did seem to be very well-synchronized in their breeding. Closely-related species might affect each other in the same way – several are known to hybridize. Off topic, but perhaps you might enjoy this unique note on Conures and False Vampire Bat Predation. Hello Shelbie, Frank Indiviglio here. Thanks for taking the time to write in; much appreciated. Please let me know if you need any further information…I’ve worked with just about every animal at the Bronx Zoo and have taught their keeper education classes as well.